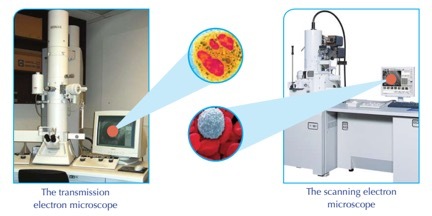 The progression of biology is based upon the development of the technologies used in cell science (cytology). This development has led to an increase in the ability of scientists to observe and analyze. Among of all the technologies, the microscope was the most important tool ever developed. The light microscope was the only available tool for scientists until 1950. This microscope depended on sunlight or artificial light to work. It was characterized by its ability to magnify micro-organisms and non-living things. It was also used for screening the composition of large objects by slicing them into thin slices which allow the light to permeate through. The light microscope could magnify objects to 1500 times their actual size, according to the magnifying power of the two lenses used (objective and ocular lenses). These lenses were made of glass. They cannot magnify more than 1500 times because the image will be blurred. Magnification = the magnifying power of ocular lens × the magnifying power of the objective lens. A distinction is made between Magnification and Resolution: Magnification is how large the image is compared to real life, whereas Resolution is the amount of information that can be seen in the image (defined as the smallest distance below which two discrete objects will be seen as one). To work out the size of an object viewed with a microscope, a Graticule is used. This is a small, transparent ruler that is superimposed over the image. As the same sample may look to be different sizes under different magnifications, the Graticule must be calibrated. There are two types of light microscope. Compound Microscopes contain several lenses and magnify a sample several hundred times. Dissecting microscopes, on the other hand, have a low final magnification but are useful when a large working distance between the observer and the stage is required (e.g. during dissection). They have two eyepieces to produce a 3D stereoscopic view. Over the years, scientists have innovated better methods to observe samples more clearly by increasing the contrast between the different parts of the sample. One method was to use dyes to stain or color certain parts of the sample so that it looked clearer. This is similar to how we screen white blood cells. On the contrary, using dyes has disadvantages, such as they kill living samples. There is also a further method that increases the contrast, done by changing the level of light. In 1950, scientists started to use the electron microscope, in which a beam of high-speed electrons is used instead of light. These electrons are controlled by electromagnetic lenses and objects can be magnified to 1,000,000 times their actual size. The electron microscope provided a field to clarify cellular components that had not been known before. More accurate details of cells can be seen because electron microscopes provide much higher-resolution, magnified, and highly contrasted images compared to those produced by light microscopes. This is related to the shortness of the wavelength of the electronic ray compared to the light ray. Images are received on a fluorescent screen or on a highly sensitive photographing board. There are two types of electron microscopes: the scanning electron microscope used for studying the cell’s surface, and the transmission electron microscope used for studying the internal structures of cells. Chemical Fixation: stabilising an organism/sample’s mobile macrostructure. Cryofixation: freezing the sample very rapidly to preserve its state. Dehydration: removing the water from a specimen, for example, by replacing it with ethanol. Embedding: embedding in resin, ready to be sectioned. Sectioning: cutting the sample into thin strips that are semitransparent to electrons, for example, with a diamond knife. Staining: using heavy metals to scatter electrons and produce contrast. Freeze fracturing: freezing the sample rapidly and then fracturing it, for example, when viewing cell membranes. Mounting: placing the sample on a copper grid. It is advantageous to use an electron microscope in many situations because they offer a much higher resolution that light microscopes and they can be used to look at very small objects in detail. However, samples must be placed in a vacuum as electrons are deflected by particles in the air, they are very expensive to buy and maintain, and preparing the samples requires a lot of skill to do.